Ditch the Camelbak when you're out riding on the road to be a look like a pro cyclist. 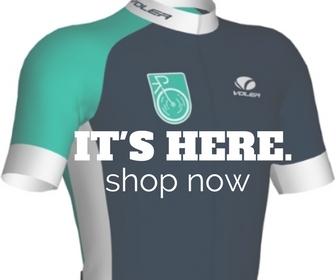 So you’ve got your new bike all shined up, your spiffy new lycra cycling kit on, and your adrenaline urging you to get out on the road. But do you also have that small twinge of fear that you look like a rookie bike rider? Relax! Don’t let lycra-clad days fill you with dread–get the inside scoop on those embarrassing questions you really, really want to ask that kitted out, speedy, pro-looking rider whizzing passed you. There are two ways to wear your sunglasses: the right way, and the . . . OK, I lied, there’s actually only one way. Always buckle your helmet up first and then slip your shades over the straps. Not only will this ensure a correct fit for your helmet, but you’ll also show off that impressive sponsor’s logo. 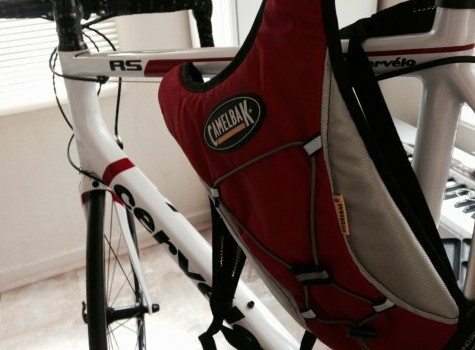 Ditch the Camelbak when you’re out riding on the road to look like a pro cyclist. Most newbie road cyclists start with this faux pas, and it’s sure to get you some funny looks from other roadies out there. All drinks should be carried in your bottle cages and not on your back. If you really want to get serious about your bike fashion, make sure your bottles match each other–but don’t get too bogged down by bottle size unless you’re riding a small frame. There is an unwritten rule about not riding the gigantic, 26oz bottles around, but if you’re heading out for a four or five hour ride you’ll be glad you brought them. As an aside, definitely look for Purist bottles that have fewer chemicals interfering with your drinks. Look for BPA and Phthalate free plastics for the best results. They affix to your helmet, hang from your bar ends, and may help you freak out when a car gets a bit too close. In road rules, there’s only one type of mirror that won’t get you labeled a “Fred”: the tiny dots that stick just inside your sunglass lenses. Now some of you may have let out a gasp of shock, or scrolled down to the comments section to let me have a piece of your mind, but hear me out on this one. Mirrors on the bike do little but distract your gaze from where it should be: on the road ahead of you. If you’re worried about seeing cars behind you, practice turning your head and upper body while keeping your bike on a straight line. Consider doing this on a low-traffic road or even a grassy yard. The better you can handle your bike, the better you can avoid a collision. Confidence is important on the bike, and constantly looking behind you poses problems not only to yourself but also to other riders in the group you’re with. Keep an eye on what’s in front of you, obey traffic laws, signal to cars where you’re planning to go, and invest in a good daytime taillight. These few tips will keep you much safer than a silly piece of glass ever could. One of the most important fashion rules for cyclists actually serves a strong purpose on the bike. Unless you’d like to deal with some pretty awful chafing after a long ride, ditch the underwear beneath your spandex (lycra). Not only is it a good idea to avoid lines, just like most situations in life, but you’ll thank yourself a hundred times when you get off the bike and are (probably) still able to walk around. Make sure you choose a snug-fitting jersey! Unless you’re in need of several sandwiches like Froome or Wiggins, you probably won’t have trouble finding a jersey that fits your frame. For those of us without chicken wings for arms, it’s tempting to search for a jersey that leaves us a bit of extra fabric flapping in the wind. Beware! A baggy jersey will actually do the opposite of making you look trim and fit! You’re working hard to log those miles, so show off your physique with properly sized spandex. The sleeves should sit snug at your arms–not tight enough to cut off your circulation, but certainly not loose enough that they might hang limply about your elbows. Go for a jersey that is fitted enough to where you can slip a finger beneath it without trouble, but it still hugs your arm. The rest of the jersey should zip up easily, and not be so tight that it rolls up your torso when you lean over. It should, however, be a snug fit that doesn’t hang limply in the back–the last thing you want is jersey-tail dragging over your saddle when you’ve filled your pockets. Remember, the point of lycra is to reduce muscle fatigue through compression, so it’s gonna be a little on the tight side. Of course there are always more tips, but these will get you started off right. 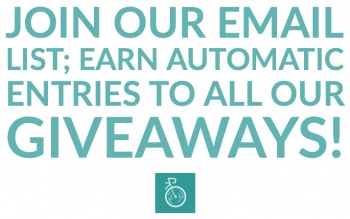 For more info on how to choose a bike and what to buy when you’re just starting out, check out the “related posts” below! Those illusions will pass as you really start to put miles on, not just ride to the coffee shop. All you need to show are your legs to prove you are a rider. On cross country rides across the deserts of the southwest, you may indeed want that camelbak unless you have a support vehicle. You’ll also may want some things to keep the sun off you.